In collaboration with Faux Jesse’s Beijing toile takes on an air of sophistication with this elegant repeat pattern that centres on an overall floral Chrysanthemum design with the Great Wall connecting modern and traditional motifs .These include The Summer Palace, a Pagoda, a Dragon Motif, Cyclists, a Willow Tree, Peking Duck, The Forbidden City, CCTV Headquarters, an ‘Opera Singer’ and many more which have all been delightfully incorporated in this beautiful toile design. 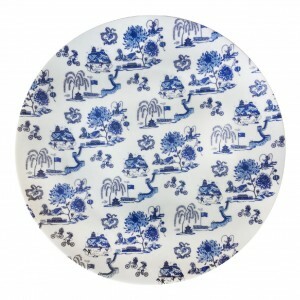 A beautiful gift box set of 6 blue fine bone china 10.5 inch dinner plates in Faux’s iconic contemporary Beijing Toile designed by Mariko Jesse. These are great for festive celebrations such as Christmas, New Year and dinner parties, these equisite plates available in classic blue and white china exportware and red on white. 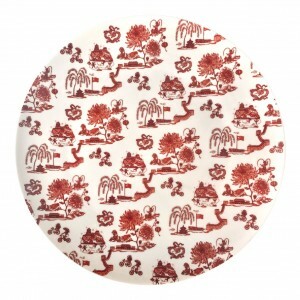 A beautiful gift box set of 6 red fine bone china 10.5 inch dinner plates in Faux’s iconic contemporary Beijing Toile designed by Mariko Jesse. These are great for festive celebrations such as Christmas, New Year and dinner parties, these equisite plates available in classic blue and white china exportware and red on white.